On January 19th the BBC devoted multi-platform coverage to an interview with Yasser Arafat’s widow to mark the tenth anniversary of his death. 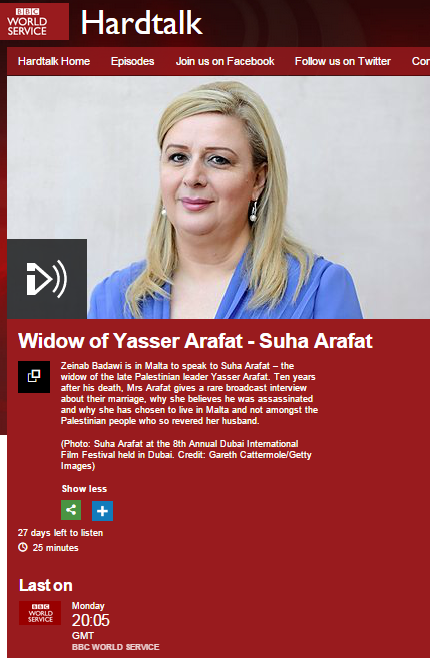 By means of that interview Suha Arafat was once again given a BBC platform from which to promote unproven theories regarding the cause of her husband’s death: a topic which the corporation has also covered extensively in the past. A recent announcement by the French authorities has to date received no coverage on the BBC News website’s Middle East page. Readers may recall that similar findings by a Russian team in 2013 received far less BBC coverage than those supporting the claim that Arafat had been poisoned.